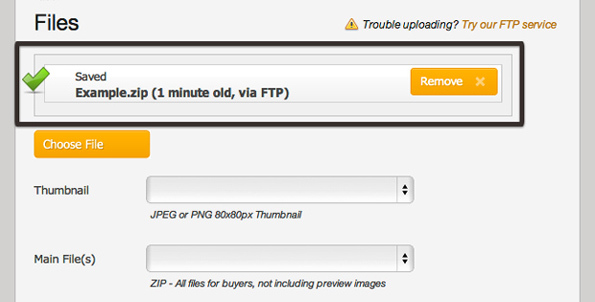 Envato Market supports FTP uploading for faster and more reliable uploads of large and multiple files. You will need to an FTP client installed, before following this process. Click 'Connect' or your FTP client equivalent. 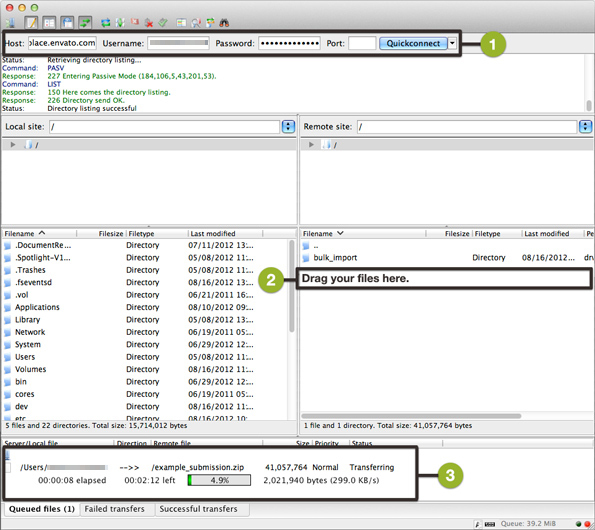 Drag your files into the upload area of the FTP client. Do not place your files in the folder marked "bulk_import". Wait for your files to process, and then close your FTP client. Go to your Envato Market author dashboard and navigate to the upload page. Your files will be there waiting, ready to be entered into the upload form and submitted. Please Note: All FTP uploads will remain in the system for 24 hours only, at which point they are automatically removed. Please ensure you submit your items for review within 24 hours of beginning the FTP upload process.